Water makes a long journey to get to our drinking tap – from its starting point as rainfall over mountains, through the natural environment, treatment plants, and pipes. Along the way, it picks up a little bit of everything it touches, including minerals, rust, and organic residues. These vary, which is why water tastes different depending on its location. Mineral composition greatly affects the taste of drinking water, the wellbeing of machinery that uses water, and the taste of the coffee we brew with it. There are many different minerals found in drinking water. The total amount of these dissolved minerals is referred to as total dissolved solids (TDS), and is usually measured in parts per million (ppm) or milligrams per litre (mg/litre) units. TDS concentration can be easily measured using a digital stick or pen. These devices make use of the fact that the more dissolved material present in water, the better its electrical conductivity. Completely pure water or H2O does not conduct electricity. This means that the result we read off the device does not give any insight into what minerals are present in the water, only an estimate of their total amount. TDS is still a good place to start when we test an unknown water sample. It tells us whether water is pure, or if it is rich in dissolved minerals. 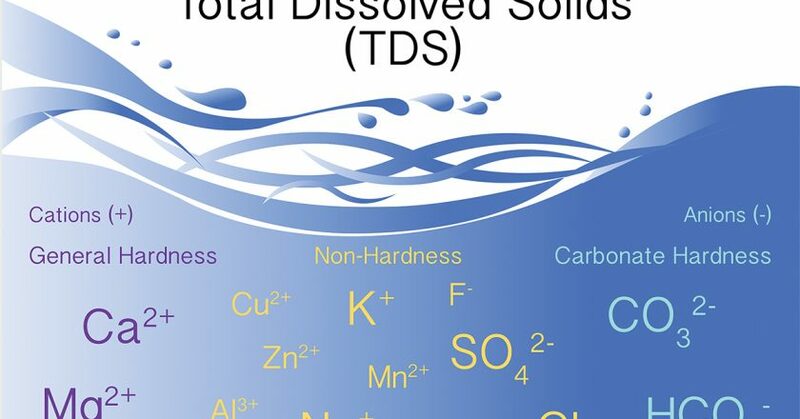 Water hardness is more selective than TDS. It focuses on the most abundant minerals in water: calcium, magnesium, carbonate and bicarbonate. These ions in the water supply originate from natural sources, such as rocks that water passes through. Calcium and magnesium carbonates have limited solubility, making them the prime suspects for causing scale build-up in machinery. It has been known for centuries that it is harder to do your laundry in hard water because it doesn’t lather nicely with soap. The language commonly used to describe water hardness stems from these old industry traditions and can be initially quite confusing. Here’s a breakdown to help you understand and describe your water with confidence. General hardness is the combined calcium (Ca2+) and magnesium (Mg2+) concentration in water. (To find out the concentrations of each separately, we’d need to do a chemical analysis beyond simple hardness tests.) While there can be many other ions dissolved in water next to calcium and magnesium, such as sodium (Na+), potassium (K+), carbonates, sulphates etc., these do not count towards GH. Carbonate hardness, like GH, singles out just two important components from the mixture of all dissolved minerals: carbonate (CO32-) and bicarbonate (HCO3-). The main source of carbonates in water are calcite rocks, while bicarbonates can also originate from atmospheric CO2 dissolving in the water. When combined with Ca2+ and Mg2+, carbonates can easily form an insoluble white precipitate called calcium carbonate (CaCO3) or magnesium carbonate (MgCO3), or better known in the coffee industry as limescale. Calcium and magnesium bicarbonates are more soluble, but boiling the water causes them to break apart into CO2, water, and the insoluble carbonates. This is why machines that heat water are at a higher risk of scale formation than those that only use cold water. Carbonate hardness is also often called alkalinity or buffer – these terms are related but have other meanings too. Stick with carbonate hardness to avoid confusion. Building your brew water from a pure water base with added minerals gives you control over exactly what’s in your water, and gives you a chance to observe the taste effects these minerals have on the coffee. Starting with concentrates is a good way to quickly create a variety of brew water recipes. I recommend preparing 1000ppm stocks, which will make diluting them to any desired GH and KH super easy. To cover all basics, you need to make three mineral concentrates: magnesium, calcium and bicarbonate. As a base, use purified water. For mineral sources, we have a couple of options to choose from. See figure 2. Calcium chloride dihydrate, CaCl2*2H2O, is our calcium source. The options are commercial, food, or laboratory grade. Commercial grade products are readily available. However, they often have chlorine residues (giving them an unpleasant swimming pool smell). Food or laboratory grade products are free of these odours. Magnesium can be added in the form of Epsom salts (magnesium sulphate heptahydrate, MgSO4*7H2O, commercial or food grade) or magnesium chloride (hexahydrate, MgCl2*6H2O, laboratory grade). It can be worth trying both to find out which one you prefer. They taste quite different. The bicarbonate source is usually baking soda (NaHCO3, food grade) or you can use KHCO3 (potassium bicarbonate, laboratory grade). Note that the sodium in baking soda can add a saltier taste. You now have the stocks to create any brew water recipe you can imagine. To a one-litre jug or bottle, add as many millilitres of concentrate as the final ppm concentration you would like to achieve. For example, if you want your brew water to contain 80ppm calcium, simply add 80 millilitres calcium (Ca) concentrate into a jug, and top up to one litre with pure water. To mix more than one ingredient, add the concentrates first (remembering that both Mg and Ca add to the final GH), then top up to one litre. See figure 3 for an example. This article features in the October 2017 edition of BeanScene Magazine.